No doubt you already know how important Facebook is as part of your overall web presence. With almost 2 billion users, an enormous number of consumers visit the site daily. Having a specific page for your business is therefore crucial. 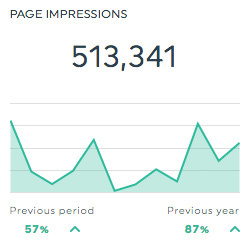 And how do we track the success and engagement of your page? Facebook Insights of course! 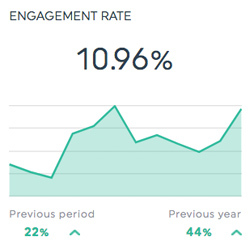 With a Facebook Insights dashboard, you can see how your Facebook page is working and what to do to optimize it. Create your Facebook Insights dashboards today! 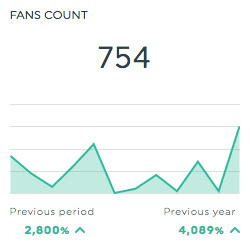 This historic widget shows the total number of fans your Facebook page has. This historic widget shows the total number of times your Facebook page is displayed. This list widget shows the top posts on your Facebook page by number of impressions. This historic widget shows the rate at which people engaged with your Facebook page. This is calculated by dividing the total engagement (likes, comments, shares, and clicks) by the total reach, and multiplying the result by 100. Want to see all our Facebook Insights reset widgets? This is the total number of people who have liked your Page. This is the average number of comments for your page posts. This is the total number of people who engaged with your Page. Engagement includes any click. This is the total number of people who liked your post. This is the number of people who engaged with your Page divided by the number of people who saw any of your content. This is the number of times your posts were seen in News Feed or Ticker or on visits to your Page. These impressions can be Fans or non-Fans. This is the total number of interactions your Facebook page received. This is the total number of people who unliked your Page. This is the number of times your Page's profile has been viewed by logged in and logged out people. This is the total number of times page’s videos have been viewed for more than 3 seconds. Want to see all our Facebook Insights metrics, segments, & dimensions? How do I create custom dashboards using Facebook Insights?